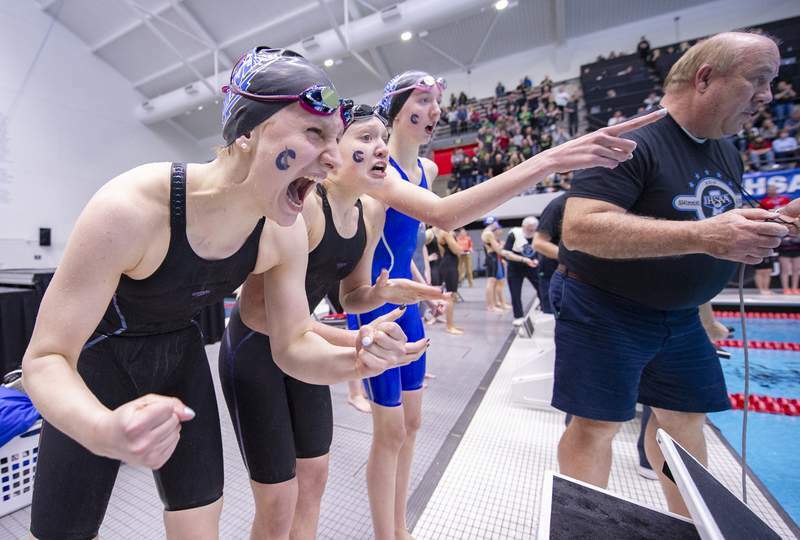 Photos by Doug McSchooler for The Journal Gazette Members of the Carroll High School 200-Yard freestyle relay team react as their team finishes second in the event during the 2019 IHSAA Girls Swimming/Diving Championship at the IU Natatorium at IUPUI on Saturday in Indianapolis. Doug McSchooler for The Journal Gazette Carroll’s Mallory Jackson reacts after winning the 100-yard backstroke during the IHSAA Girls Swimming/Diving Championship on Saturday. 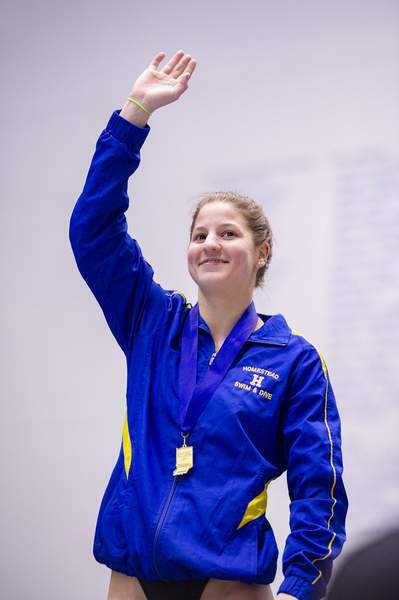 Homestead diver Jackie Brenn waves from atop the podium after winning the second state title of her career on Saturday. 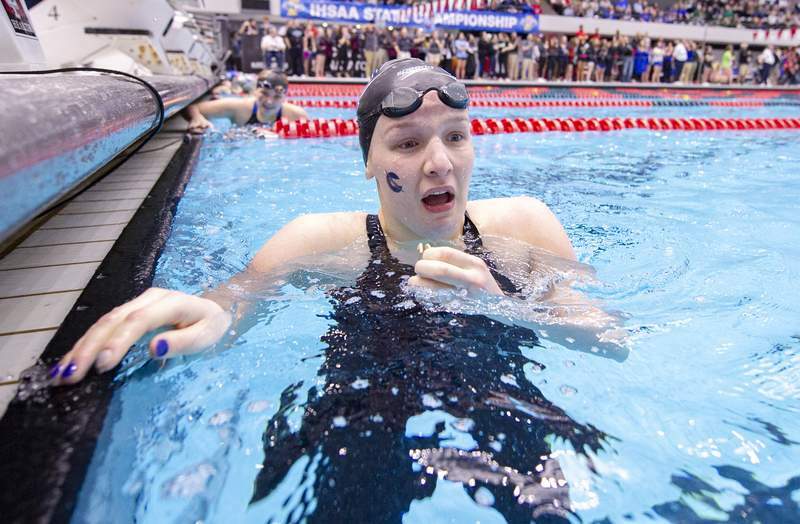 INDIANAPOLIS – The day couldn't have been much better for Carroll junior swimmer Mallory Jackson, who became the school's first individual champion in her sport. But it was the team's third-place finish that left her nearly speechless. Jackson was on the Chargers' 200 and 400 freestyle relay teams that placed second to help Carroll finish in a third-place tie with Fishers with 165 points Saturday in IHSAA Girls Swimming and Diving State Finals at the IU Natatorium at IUPUI. Carmel won its 33rd consecutive state championship with 413. Franklin placed second with 167.5. Homestead, helped by senior Jackie Brenn's 1-meter diving title, finished seventh with 140. Joining Jackson on the Chargers' second-place relay teams were junior Mya VanderHagen, sophomore Teagen Moon and freshman Mya DeWitt. Gibson said Jackson was a little disappointed in her sixth-place finish in the 200 individual medley. Jackson nipped Chesterton's Jaclyn Klimczak for the victory. Moon finished third in the 100 butterfly. “Last year I was bummed I didn't make the finals heat (in the butterfly) so that was my goal this year,” she said. Gibson said Moon had awesome relay swims as well. “Best on the team,” Gibson said. Moon also was on the 200 medley team, which placed fifth. VanderHagen place eighth in the 100 butterfly and DeWitt was ninth in 100 backstroke. It was diver Brenn's second state title. She won as a freshman and was second her sophomore and junior year. Homestead coach Justin Max said he was pleased with everything except the 200 freestyle relay's disqualification in the championship heat. Homestead's relay team of Shelby Crist, Cora Walrond, Audrey Crowel and Kyra Tonsil placed third in the 200 individual medley relay. Crist was the Spartans' top individual finisher with a fifth in the 100 backstroke. Crowel finished sixth in the 200 freestyle and Maggie Stock took seventh in 100 freestyle. Warsaw senior Delaney Wihebrink placed third in the 100 breaststroke. Other Homestead finishers was Stock, ninth, 200 IM, Crowel, 12th, 100 butterfly; Crist, 15th, 100; Lily Kaiser, 500 freestyle and 200 IM, 15th; Tonsil, 50 freestyle,15th and Halle Weaver, 16th, 100 freestyle. For Bishop Dwenger, Anna Yaggy was 14th in the 1-meter diving and Laura Wright was 10th in the 100 breaststroke.